There is a good chance that I will be the Teaching Assistant for this course. It does look a lot like you but the hair is too long. That link in #1 is not correct. How about you join my course? I do not know anything about Haskell. I would say that it is not possible for me to attend but I would assist you if you need some help. May I ask why it is not possible for you to attend? I could talk to you about it in a PM. I am sure you will find it a curiously mundane reason but a reason nonetheless. Congratulations Agnishom. But I what is haskell programming??? What is NPTEL? ?Is it given to you By IIT Madras?? Oh excellent work, keep it up!!! 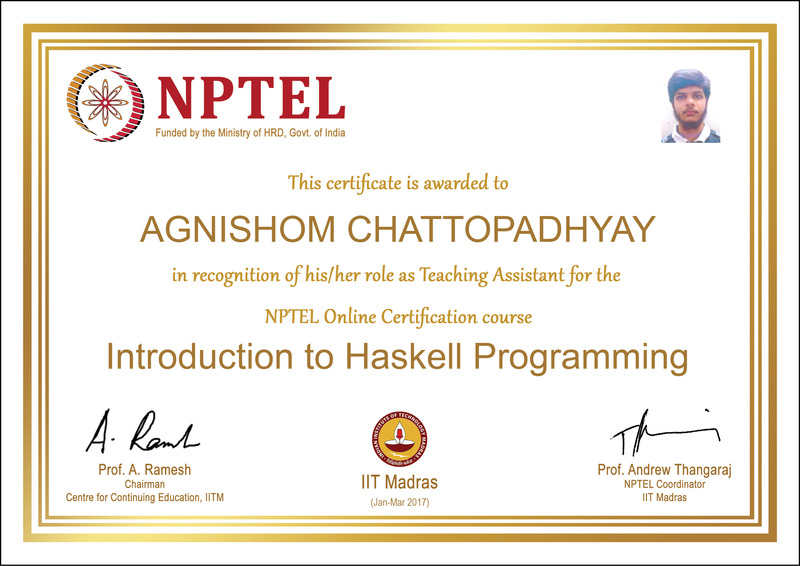 NPTEL is an organization that hosts online courses. I recommend you to look it up. Haskell is a programming language that changes the regular imperative way that we program.